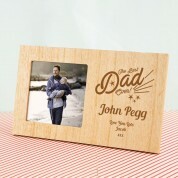 A fun gift idea for Dad on Father's day or his birthday! Place an instagram photo in it to really make him smile. 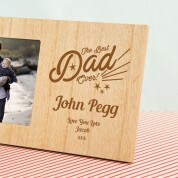 The rustic effect frame is laser engraved by us with a bold design. It reads: “The best Dad Ever”. The text is surrounded by stars and his name is included in a scripted font below. There is also room for a short “with love” message of your choice, making this a really personal gift he will love to show off! He can proudly display it on the mantle piece, or have it by his bedside to remember how loved he is. Our professionals work in house to carefully engrave onto the wood for unique results every time. 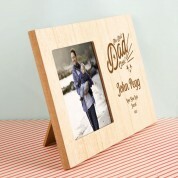 The frame features a small square photo window - perfect for an Instagram snap.